Disney/Pixarʼs Cars is one of my favorite animated films of all time. I enjoyed how committed they were to the theme of a world composed entirely of cars from names of the different locations all the way down to the way the landscape was built. Iʼll admit I was a little surprised to find out when they were releasing Planes in the first place. It just felt like Planes was defying my immersion in the Cars universe. The sequel felt even more odd. It felt like a full theatrical release that could have gone straight to DVD or maybe even a spin-off TV series. 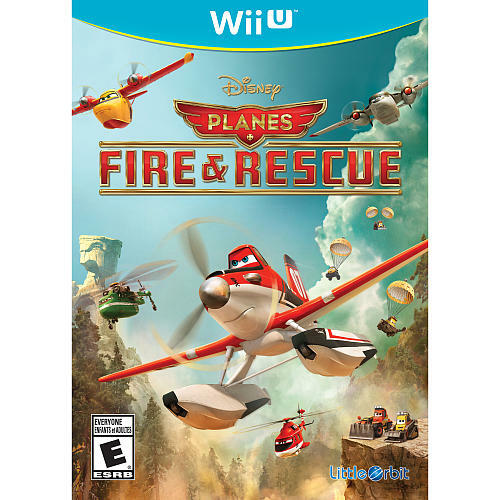 My experience with Planes: Fire and Rescue is very similar. It feels like a full retail release that seems better suited for a mobile game. The gameplay is simple. Each level consists of a navigating around different maps and completing different challenges. The perspective is entirely from the top down. It is as though you are standing above one of those Thomas the Tank engine train tables we all bought for our children to play with when they were three only to have them abandon it after a year (No. Iʼm not bitter or anything) and looking down on it while flying planes around. This perspective is VERY odd for a game about flying because it robs the levels of any sort of verticality. The fact that you canʼt even fly over mountains in the various levels is just… weird. The different challenges are somewhat interesting, but they all involve roughly the same steps. Things are mixed up ever so slightly in a few of the missions that involve driving a little digger around, but this doesnʼt happen often enough (nor is it good enough) for it5 to move the needle. My family really struggled to enjoy this game for more than a few minutes at a time which would have been perfect for a mobile game. The game play may not be perfect, but this game is perfectly acceptable for younger players. The controls are simple and will not cause a problem for younger players. They might struggle initially with turning since plans canʼt exactly turn on a dime, but patient children will learn over time. Easily frustrated children might, however, just move on to other things. I simply cannot recommend this game for many people. The only place I can imagine this game fitting in is with households who are completely obsessed with all things Planes. This game might be worth it just for the initial reaction for your kids (even if they might get disappointed afterwards). Full Disclosure: A download code was provided for the purposes of this review.